Fastest Lap: Morris 1m26.881s (97.62mph). The Strasse Class one Pilot Richard Ellis driving the 993C struggled in qualifying putting him in 14th place on the grid for the start of the race, the third Strasse Pilot David Botterhill was not present for this weekends meeting due to other commitments. With only six points behind the overall championship Leader "Mark Sumpter" Dyer was hoping to close the gap and with Sumpter qualifying in fourth that gap looked even closer for the class two leader to close. As the green flag dropped Dyer was off to a good start and was soon on the tail of Scott, Dyer was looking for an overtaking opportunity that came on the fourth lap when Dyer darted down the inside at Allard corner and soon but a good gap between himself and Scot who soon after spun off ending his race leaving Dyer in a comfortable lead. Scott was not the only casualty of the race with Class 1 pole sitter Ben Demetriou having brake failure leaving his 968cs spinning out of control across the grass at Seagrave Corner. 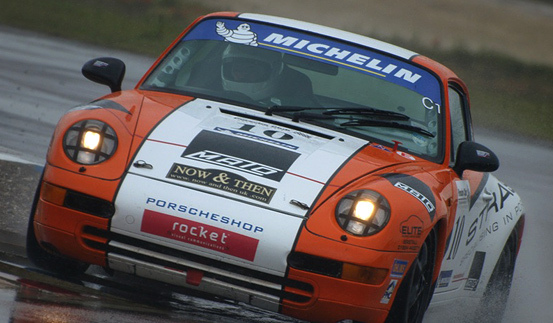 Richard Bennett and Paul Follett both driving Porsche 968's exchanged paint work leaving the 968 of Follett with front end damage after Follett tried to slot into a gap also been closed by someone else leaving nowhere for Follett to go but into the back of Bennett. In Class 1 Sumpter came second with Miles Maserati taking the chequered flag, Strasse pilot Richard Ellis who qualified 10th on the grid came home in 13th place after struggling with a brake sensor problem on the Porsche 993C car. Chris Dyer...Got a realy good start got past Paul Follett straight away and Malcomn Scott got straight on the back of Kevin Harrison and keep behind in for a couple of laps got past him and tried to get past Tim Speed but his 968 is a bit wider, a nice wide 968 I could not get past him, I got close a couple of times but he kept shutting the door on me but it was clean and a good race I enjoyed it. The team awoke to a down pour with terrible driving conditions and with no hope or signs of the rain dispersing for the midday race the decision was taken early in the morning to switch to wets and adjust the cars to wet driving conditions. 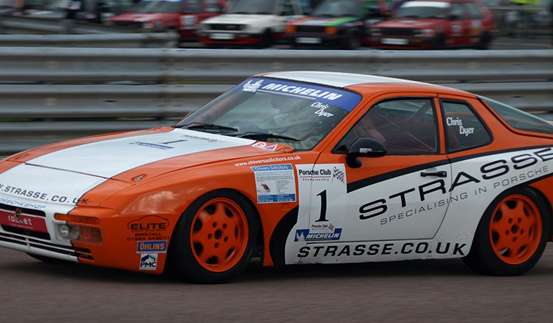 You need nerves of steel to compete for top spot at Thruxton even more so in the wet and Chris Dyer knew that he had battle ahead just to keep the 944 car on the track as well has pushing for top spot. A mad dash repair was needed for the 993 of Richard Ellis after discovering that the ABS problem from Saturdays race was a broken lead on the back near side. The times set from Saturday put Dyer 12th on the grid with Ellis in 13th place, both Strasse pilots got off to a good start but there was nothing that Dyer could do to stop Malcolm Scott in the red 944 setting of at a blistering pace right from the start to take the lead in class two. Apart from a few nervy twitching back ends everyone made it around for the first few laps before the gaps started to separate the field, Dyer was unable to do anything about Scott who was putting in some astonishing times in the wet and soon a 20 second gap separated the two leading class two cars a twenty second gap that Dyer was unable to do anything about. Apart from a few bum clenching moments Scott managed to hold on the class 2 lead with Dyer crossing the line in second place. Richard Ellis put in brave fight but with slower traffic in front and fighting for grip Ellis was more than happy to bring the 993 home in 14th place and in one piece. Strasse racing was also keeping a close eye on the class one lead championship rival Mark Sumpter who was leading the race until the last lap when he spun off allowing Richard Lambert to take first place with Sumpter following closely behind to take 2nd. The race ended in drama after Miles Maserati spun off on the last lap and hitting the beached car of Mark McAleer after he himself had spun off earlier in the race, both cars where practically destroyed but thankfully no pilots where hurt during the event. Richard Ellis…after the first race I was not very confident in the brakes, I got a fairly good start everyone piled into the first corner left them all to it until I was confident with my own brakes couple of laps later I managed to get the brakes working how I wanted them, but the car I just could not get it to drive how I wanted it to so I think I dropped it off to much or generally just did not have it set up right for wet it was under steer and over steer so I just brought it home glad its in one piece rather than the car been in the wall.